Part 2: Use the magic of Flex Time for easier quantising of multitracked drums. A quantised (top) and unquantised drum part. Logic has had excellent MIDI quantisation for a long time, but its audio quantisation facilities have lagged significantly behind Pro Tools — until now, and the introduction of Flex Time, which gives us the freedom to non‑destructively quantise the audio events within a region. 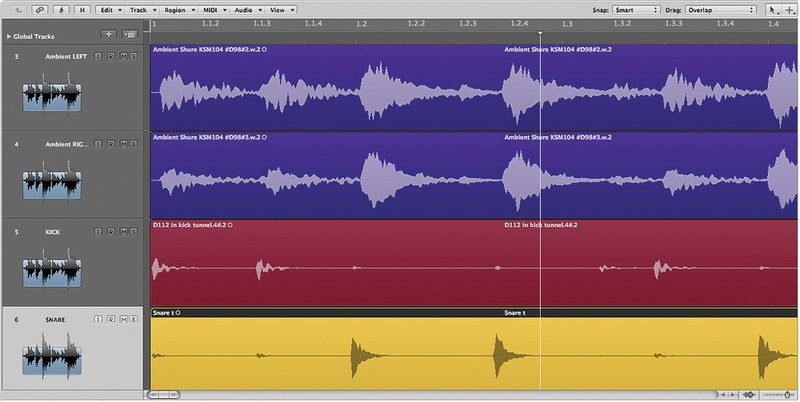 The audio quantise engine works by snapping the detected Transient markers of an audio file to Logic's timing grid. Let's first look at a simple example, using a recording of a bass guitar. You can use any equivalent. 1. Open Flex Time (View / Flex View). From the Flex Mode menu in the track header, choose Monophonic. 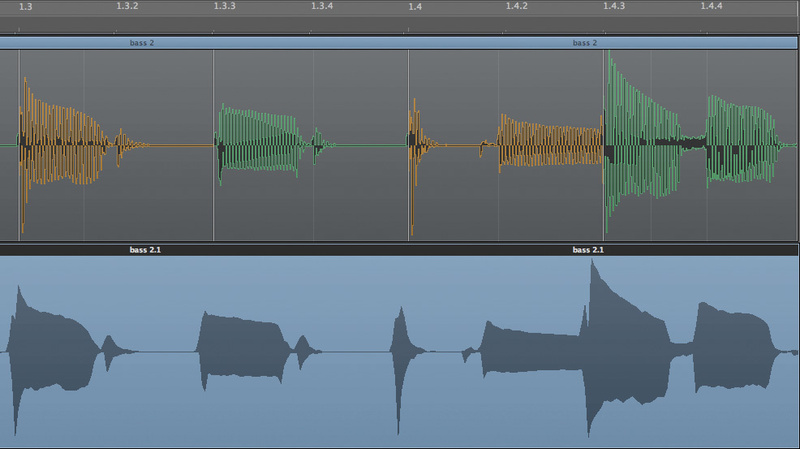 Logic will now automatically detect the transients in the audio you've chosen and insert a Transient marker at each. Typically, it adds more Transient markers than needed. To adjust the number of markers, open the Sample Editor, click the Transient Editing Mode button to the right of the View menu, and use the +/‑ buttons next to the Transient Editing Mode button to tweak the sensitivity of detection until there are no unnecessary markers. The detection process is very sensitive and will pick up all sorts of things like spill from other parts of the kit, placing markers that may be superfluous. You only need markers on your main drum hits, such as kick or snare. 2. Select the bass guitar region, go to the inspector and open the Region Parameter box to display Logic's quantise options. 3. Now go to the Quantize menu and choose your desired note division. 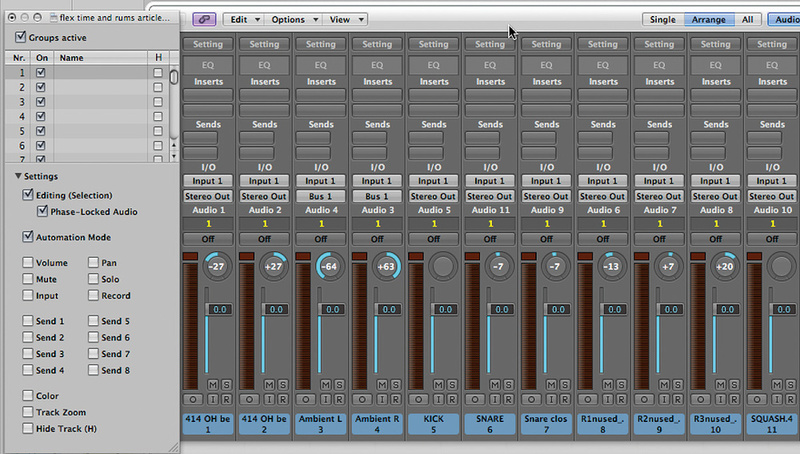 Logic moves the audio so that the nearest Transient markers line up with the quantisation grid. The ambient mics (top) have picked up the drum signals slightly later than the close mics. 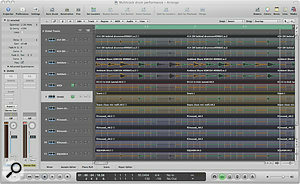 Multitrack quantising will work better if the distant‑miked tracks are moved properly into sync with the close‑miked ones. You can make the process of quantisation more subtle if you adjust the Q‑Strength and more targeted if you adjust the Q‑range parameters found in the Advanced Quantization section of the Region Parameter box. The Q‑strength controls how much quantisation takes place, with 100 percent resulting in full quantisation and, for example, 50 percent moving an audio event at a Transient marker 50 percent of the distance to the nearest grid position. Careful use of quantisation strength tightens a performance while preserving some of the original feel. Q‑range is a bit trickier to understand. Positive Q‑range values force the quantise setting to only affect notes within the Q‑range of the quantise grid setting. For example, with quantise set to eighth notes and a Q‑range set to a 32nd note, the only notes that would be quantised are those within a 32nd note of the eighth‑note grid. This is useful for busy parts, preventing events outside the Q‑range from being wrongly quantised. Negative Q‑range values are useful if the majority of a performance is bang‑on, except for the odd note. With negative values, the quantise setting works only on notes a distance greater than or equal to the Q‑range away from the grid. This is a great way to quantise only the most wayward events. Get to know the Q‑range and Q‑strength controls, as they let you use quantising to subtly tighten a performance, rather than slamming it robotically to a grid. Now let's move on to multitrack drum quantisation. Apple produced an excellent document on this, called 'Tips for phase‑locked drum edits' (http://support.apple.com/kb/HT3656), which you should read. Rather than simply rehashing that, I'm going to try to augment it with my personal experience of using Flex Time for drum editing. I can't emphasise too strongly that the key to successful quantisation of multitracked drums is good preparation and having realistic expectations of what can be achieved with Flex Time. The ambient mic recording is about to have 1288 samples trimmed from its start. It will then be 'moved back in time' by the same number of samples, using the Sample Delay plug‑in, to line up with the close‑mic tracks. 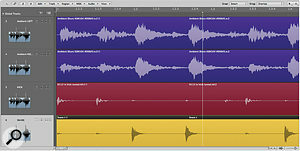 When you record drums, signals may arrive at some mics significantly later than it arrives at others, such as the close mics (see screen above, which shows a drum recording where the ambient mics, in purple, are lagging the close mics, in red and yellow). 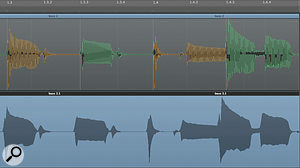 Delays between tracks can create artifacts during multitrack quantising, and moving distant‑miked tracks into line with close‑miked ones improves the transparency of the process. 1. Open the audio file in the sample editor and go View / Samples, so that the timeline is displayed in samples. 2. Select the delayed amount that you need to remove from the start (the info display in the sample editor will give you its length in samples). Delete that section to bring the transients into line with the close mics. If you are working with stereo pairs you need to remove the same amount from each, to preserve coherence. 3. Now, on your room mics channel, call up Logic's sample‑delay plug‑in and enter the number of samples you deleted. This will put your room mics back where they were originally (note that there is a bonus to this: changing the sample‑delay time of your ambient mics is a great way to alter your recorded drum sound). In the example below left, I'm about to delete 1288 samples from the start of the ambient mic recording, to bring it into line with the close mics on the Arrange page. 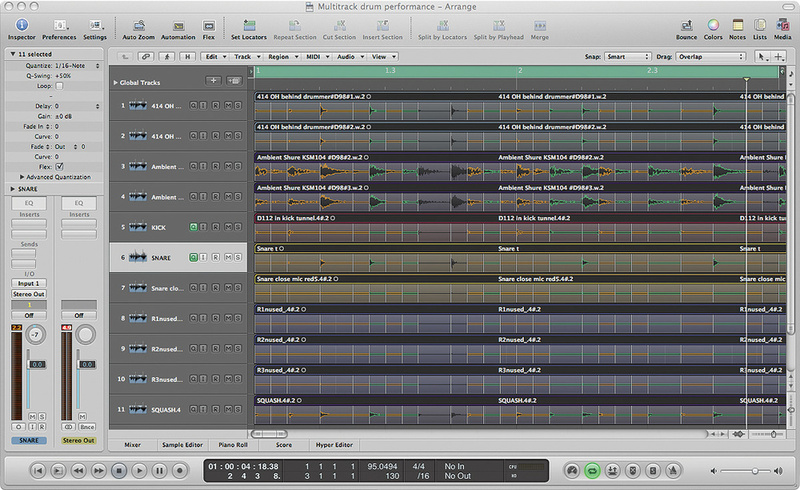 The next stage is to edit the drum performance into sections. Being able to treat sections with different quantise types and amounts is important, as it's unlikely that one quantisation setup will suit an entire performance. For example, the verse may have a straight eighth‑note feel but the chorus might be based around a quaver triplet feel. Add the range of meters that drummers use in their fills to the equation and it's unlikely that simply choosing eighth‑note quantising for a whole performance will do. It's also important not to quantise an entire performance to correct a few wayward bars. In this situation, create sections for just the wayward bars and apply a quantise template from a previous good bar to those areas, to maintain the same feel. When you're separating your drums into sections, make sure the regions keep exactly the same start and end points. An easy way to ensure this is to group the tracks. Go to the track mixer, highlight the drum channels and assign them to Group 1. You do this by clicking in a Group box (immediately above the fader and the Automation Mode box) and using the drop‑down menu. In the Group Settings window, tick Editing Selection and Phase Locked Audio, which you will need later on (see top screen). In the Group Settings window, Editing Selection and Phase‑locked Audio should be ticked. Now all editing actions will apply equally across all drum tracks. Switch the group on and off by using Command‑G (Toggle Group Clutch). We're now ready to quantise the recording. When quantising multitracked drums in Logic, you need to set some of them as 'Q‑reference' tracks: the Transient markers in these tracks determine the quantisation for the whole group. For quantisation of basic drum beats, the combination of kick and snare close‑mic tracks is usually enough, but this decision is context sensitive. The crucial thing to understand about your Q‑reference tracks is that their Transient markers will be imprinted across the other grouped drum tracks, and will snap the whole group to Logic's timing grid. 1. Turn group settings off, using Toggle Group Clutch (Command‑G). The Q‑reference button in the track header. Activating this for a track turns it into a Q‑Reference track for quantising other tracks in the group. 2. Open the kick region in the sample editor and go Audio File / Detect Transient. Edit the Transient marker sensitivity using the +/‑ keys mentioned earlier, so that only the kick‑drum hits have markers. You may also need to do a little manual editing of these, as explained in last month's workshop. Repeat the procedure for the snare. 3. Turn the group settings back on. 4. In the track header on the Arrange page, turn on the Q‑reference button (see screen, left) for the snare and kick tracks. You must do this before proceeding to step 5! 6. On a Q‑reference track, choose Slicing from the Flex Mode menu in the track header. 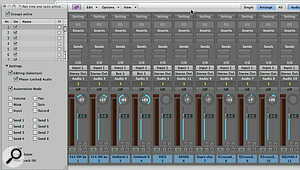 As the drum tracks are grouped, they should automatically follow, setting themselves to Slicing. All tracks should display Transient markers from the Kick and Snare Q‑reference tracks. In the Inspector's Region Parameter box you can choose a quantise setting, and turn on Flex Time for sections where it will be needed. 7. In the Inspector's Region Parameter box (see screen below), choose your quantise setting. Try 1/8 or 1/16 to begin with, if you are unsure. Remember, quantise settings are region parameters and can be different for each section. Also within the Region Parameter box is a Flex tick‑box, to enable you to turn Flex Time on for just the sections that need their timing edited. Listen to a complete section of the drum performance. If any glitches occur, check your Transient markers. If the problem is not caused by a Transient marker, adjusting the Q‑range may be the solution. (In the support document I mentioned earlier, Apple recommend starting with a default Q‑range value of a 32nd note.) Once your Transient markers and Q‑range are set so that the quantisation settings are working with the drum performance, set the Q-strength parameter so that the drum performance has been tightened, but enough of the original feel remains. Repeat for the rest of the drum part. Congratulations: you should now have a good‑sounding quantised drum recording!